The French education system, which differs from international standards, is sometimes difficult for foreigners to understand. To help you understand it more clearly, here is a resume of the general sequence followed by the majority of French schoolchildren. School begins at the age of 3 years in nursery followed by primary school where from the first year of Infant school the children begin to learn a foreign language(1) (generally English). At the age of 11 the children move into secondary education until the age of 18. This period includes 4 years in secondary school, where at the age of 13, in Quatrième (4ème), they take on a second modern language, and where at the age of 15, in Troisième (3ème), they sit a National exam: the Brevet National Diploma. The pupils then go to a general High School, known as a Lycée(2, for 3 years. 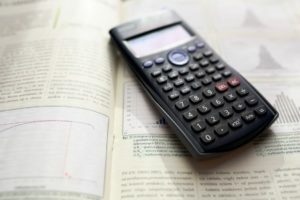 At the age of 17, in Première (1ère), the students take the French Baccalaureat exam and in the final year, Terminal, they take the General Baccalaureat exams. Once they have achieved the “Bac“ the students can continue their studies in Higher Education; at University, in a BTS (Higher Technician Certificate), or a DUT (Technical University Diploma) or in the Grandes Ecoles (Specialist Higher Education Training Schools). 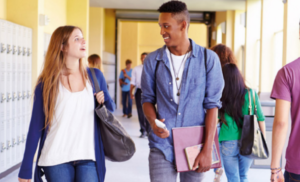 Young foreign students who come to France to attend school, whether for 3 months, 6 months or a year, generally join the first year of Lycée (Seconde/2nde) or the second year of Lycée (Première/1ère). 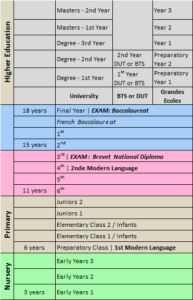 Here are some additional details about Lycée in France. (1) From Infants to Juniors the pupils are introduced to the English language. In secondary school they can choose between different modern languages (English, German or Spanish) according to the school. At the age of 13, in Quatrième (4ème) they can choose English, German, Spanish or Italian as a second modern language (LV2). Other languages are offered for Lycée students who wish to do a third modern language (LV3) (Chinese, Russian, Portuguese, Japanese,…). (2) 20% choose to study at a private Lycée, the majority of students go to a public Lycée. French High School students go to school 5 days a week: Monday, Tuesday, Thursday and Friday for a full day (lessons from 8:00-9:00 to 16:00-18:00) and in the morning on Wednesday or Saturday (depending on the school) from 8:00 to 12:00. On average the weekly timetable includes 27 hours of lessons. In the morning the students usually receive 4 hours of lessons with a 15-minute break at 10:00. At midday the students usually have a 1 – 2 hour break. They can go home to eat or eat with their friends at the school canteen (normally self-service with a limited choice of meals). Access to the canteen usually requires pre-payment for the meals which is recorded on a magnetic card that the students present at the canteen entrance (1 passage = 1 meal). In the afternoon the students receive 3 – 4 hours of lessons with a 15-minute break at 15:30/16:00. Extra-curricular activities (sport, music, theatre, art, etc.) take place in clubs and associations outside of school on Wednesday or Saturday afternoons, or after school during the week. After the school day the students have “homework” to do (exercises, lessons to learn, research to carry out…). The L Stream (Literature) is centered on literary studies in line with the modern world. It promotes the study of modern languages and offers a varied choice of speciality courses. These are the schedules and subjects for students in Première L* : 4 hours of French, 4 hours of History-Geography, 4½ hours of 2 Modern Languages, 2 hours of Sport, ½ hour of Moral and Civic Education, 1½ hours of Science, 2 hours of Literature, 2 hours of Foreign Literature in a Foreign Language, 3 hours of Compulsory Education (either: a 3rd Modern Language, further tuition in the 1st or 2nd Modern Language, Languages and culture of Antiquity, Art (5h) or Circus Arts (8h)). A total of 26½ hours of lessons per week. The ES Stream (Economics and Social) allows students progressively to appropriate the concepts, methods and critical issues of three social sciences: Economics, Sociology and Political Sciences. The school week includes*: 4 hours of French, 4 hours of History-Geography, 4½ hours of 2 Modern Languages, 2 hours of Sport, ½ hour of Moral and Civic Education, 3 hours of Mathematics, 1½ hours of Science and 5 hours of Economic and Social Sciences. A total of 27½ hours of lessons per week. The S Stream (Scientific) is for students motivated by scientific subjects (Mathematics, Physics-Chemistry…), Ecology and Agronomy, Computer and Digital Sciences. Each week the students have*: 4 hours of French, 2½ hours of History-Geography, 4½ hours of 2 Modern Languages, 2 hours of Sport, 4 hours of Mathematics, 3 hours of Physics-Chemistry, 3 hours of Biology. A total of 26½ hours of lessons per week. *Whichever stream they are in every Lycée student in Première also receives 2 hours of personalised support and 1 hour of supervised personal work per week. They can also choose 2 optional classes of 2 or 3 hours in subjects such as Computing and Digital Creation, Art (a choice of Creative Arts, Cinema-Audiovisual Studies, Dance, History of Art, Music, Theatre), a 3rd Modern Language or Sport. – The first exam at the end of Première includes tests in written and oral French, a test in TPE (Supervised Personal Work) and, for the L and ES streams, a written test in Science. – In the final year the final exam includes between 8 and 10 subjects, and varies according to the stream. Those students who obtain an average mark of more than 10 out of 20 on this examination are accepted and become Baccalaureat “graduates”. Depending on the mark achieved, merits are awarded: Quite Good between 12 and 14 out of 20, Good from 14 to 16 out of 20, and Very Good for those who get more than 16 out of 20. The merits are useful for the pursuit of studies, in particular to enter selective specialities (Preparatory Classes, Specialist Higher Education Training Schools…). >>> Tempted by the experience of going to Lycee in France? Find out more on the SILC programme, or contact us at hello@silc-international.com !